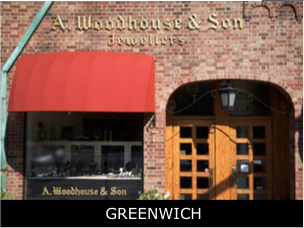 A. Woodhouse & Son, located at the top of Greenwich Avenue, has a pedigree which dates back to the 17th century as one of England’s finest purveyors of jewelry and silver. 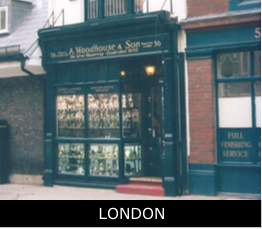 Founded in 1690 by Haldanby Langley as “The Silver Mouse Trap,” the London store has been owned by the Woodhouse family since 1912. It is a store for discriminating buyers who want exceptional items for now and for future generations. beautifully with the newer jewelry sold at A. Woodhouse. The newer pieces will no doubt be classics. There is nothing trendy about what A. Woodhouse sells, which makes every purchase something that will give you or the recipient years of pride and pleasure in owning it. 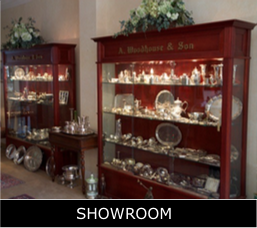 A. Woodhouse also offers appraisals and custom design work. David and his wife, Vanda, both Graduate Gemologists, respect how people view money and spending. Whether you have to save for something luxurious or you can buy it without asking the price, you can be assured that every item at A. Woodhouse is priced honestly and realistically. There is a very impressive selection of recently and gently owned prestigious timepieces. What you save on these items will no doubt enable you to buy A. Woodhouse & Sons’ extraordinary giftware and silver objects. Here you will find beautiful goblets, sterling meat platters (not silver plate), fish knives, serving pieces, museum quality vases made of glass with smooth silver designs, match safes, and beautiful lorgnettes (a lovely alternative to reading glasses). David travels to Europe four to five times a year to look for such treasures.